What inspiration to begin this beautiful Saturday morning! It has been my experience that through prayer the power of prayers for forgiveness toward the “evil-doer” is like lifting a weight off my own shoulders. I endured thirteen years of being cheated on, and both mental and physical abuse. After finally divorcing I harbored such terrible feelings toward my ex husband that it was destroying me inside. I prayed for a couple of years for the ability to let these feelings go. One day, I was praying on my way to work, suddenly it was over. Tears streamed down my face that day, and it was over. God took the I’ll feeling from me. I believe Satan wanted to destroy me internally. 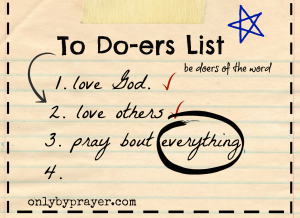 Nothing is more powerful than our Heavenly Father and the power of prayer. 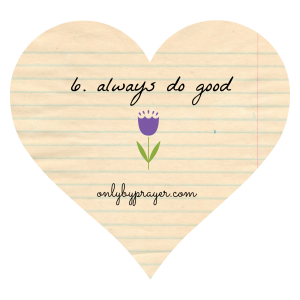 Always do good…you will be grateful and have peace. Rhonda, thank you for sharing this very heartfelt story of God’s grace. I see from reading this, when we do good to others we benefit as well. Thank you for this heartfelt words that I know will encourage someone else today and in the days to come. Prayer is a mighty healer and praised God you prayed it through and didn’t quit. You didn’t wait to pray until your feelings lined up and you felt like it; no. Your prayers made your feelings get into line and God healed you. Amen for that great victory! 1. 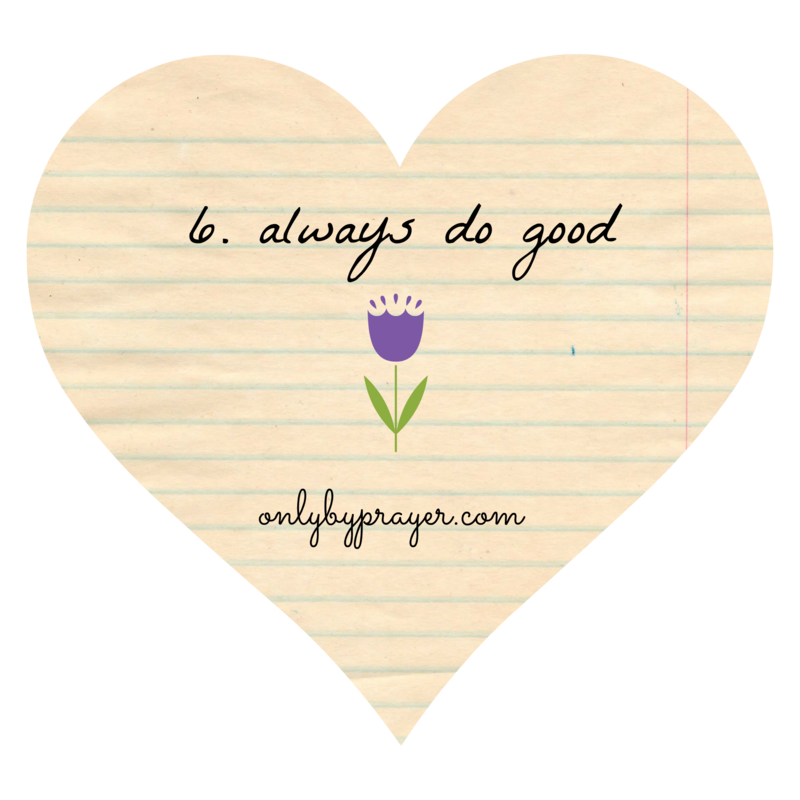 There is a connection between doing good and prayer. 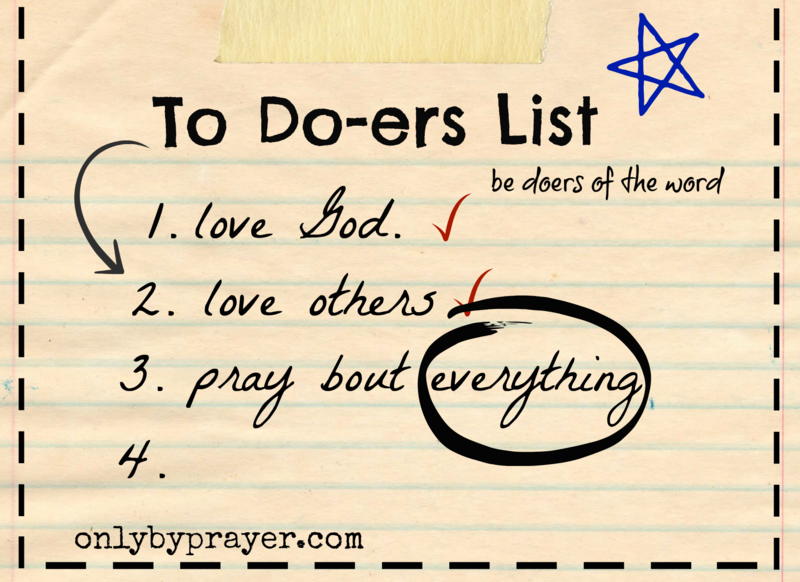 I need to cover my doing good with prayer. 2. There is a connection between doing good and joy. Doing Good will always eventually bring me joy. 3. Doing good always requires sacrifice. I sacrifice my plans, my paybacks to do good. Sacrifice can be hard, therefore doing good can be hard. Thank you, Nancy! God is good! This was great to read today! My favorite part is where you write that always doing good means we must “sacrifice our right to be angry, our right to be hurt, and our right to be bitter.” I think it’s really easy (at least for me) to keep hold of our hurt and bitterness because we think we have a right to feel that way. But like you said, this is living by the “eye for an eye” standard. Whatever our reason for being hurt, living like Jesus means we will try to do good instead of holding on to bitterness. Thank you for making clear to me that hanging on to old hurts and wounds is the “eye for an eye” mentality.I am with you on this one, Elaina. I have been busy nurturing bitterness instead of planting seeds of goodness. Thanks for sharing! If we keep those things what other people have done to us we will never heal. There will always be a thorn in our flesh. I asked The Lord to reveal things in my life where I may have done someone wrong or said something. Well one day something came to mind and I really didn’t feel like bringing that incident back up. I thought it had been forgotten. But I prayed and asked so I was burdened about what I did so I contacted that person and at first they didn’t want to talk to me. After I explained why I called it was easy because I explained how God had brought them to me and to make things right. It turned out so great and we both felt better. I praised God that day for His work in my life. Jellene, Thank you for being very upfront and encouraging. I love your straightforward approach to life. Thank you for sharing!